When deciding on centerpieces for conference tables, the event itself will play a role in the type of centerpieces you choose. If the event you are planning is a fundraiser, you will want to choose centerpieces that are more economical or even beneficial to the cause. For instance, if you're planning a fundraiser to help schools in your local community, it would be a good idea to get some of the students involved in making centerpieces. Another idea for a community fundraiser centerpiece is to find a local business that will donate items for table centerpieces. One example could be a neighborhood cleanup project. You can ask a local nursery to provide tree seedlings and make a decorative centerpiece using the seedlings. When the event is over, the seedlings can be used to plant new trees around the community. If you are holding an event to raise money for a battered women's shelter, you can go to the local dollar store and buy personal care items such as toothpaste, deodorant, razors, combs, brushes, hair accessories, etc. Using these items, you can make individual care packages by putting everything in little plastic or wicker baskets (also available at the dollar store). Wrap the baskets in transparent, colored cellophane and tie a pretty ribbon around each one. These will make attractive centerpieces that can be given to the women in need after the event is over. One of the most common events that centerpieces are needed for are weddings. 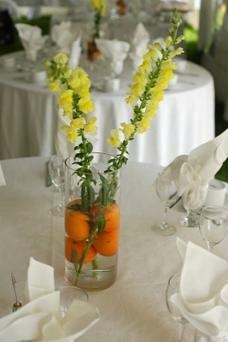 If you are working with a wedding planner, he or she will probably present you with some ideas about centerpieces. Many couples choose to do a themed wedding. A wedding theme can be just about anything that the bride and groom want. Whether it's a fairytale theme or something from science fiction, there is no wrong way to do a wedding theme. What might seem tacky to one person could be a dream come true for another. A couple may choose an Asian theme for their wedding and plan to honeymoon in China or Japan. A simple and inexpensive centerpiece for a wedding like this would be a clear vase filled with polished rocks, water and a couple of pieces of bamboo in each. A great idea for a small, intimate, outdoor, rustic style wedding held in the mountains would be the Capri Tabletop LP fire pit. These decorative stone resin fire pits are fueled by a small, one pound Coleman gas canister. They would make excellent centerpieces for tables set up on an outdoor patio of a mountain resort. Although they are romantic and attractive, these fire pits are a bit pricey. They might become cost prohibitive for large wedding, however, for a smaller ceremony with only a few tables, they would make interesting and unique centerpieces. Deciding on table decor for a corporate event will depend on your budget as well as other variables such as the type of business and the reason for the event. A good resource to help you plan for a corporate event is Awesome Events, Inc. Awesome Events Inc. has do-it-yourself centerpiece kits that can help you design your own custom table centerpieces. You get to choose the design and color options. Each kit contains detailed instructions and a photograph of what the completed centerpiece will look like. You will need a glue gun or spray adhesive to make the centerpieces, which include techniques that professional designers use. Awesome Events also has a recycle program. You have the option of returning the products you purchased for your event. You must pay the return shipping and the refund will depend on the pre-determined amount allotted for the specific product and the condition of the products returned. 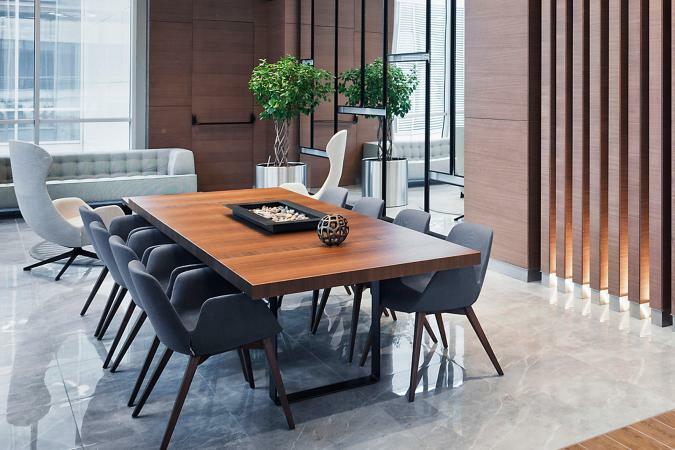 Whether you make them yourself or you have centerpieces for conference tables made for you, the possibilities for decorative table focal points are as endless as your imagination.